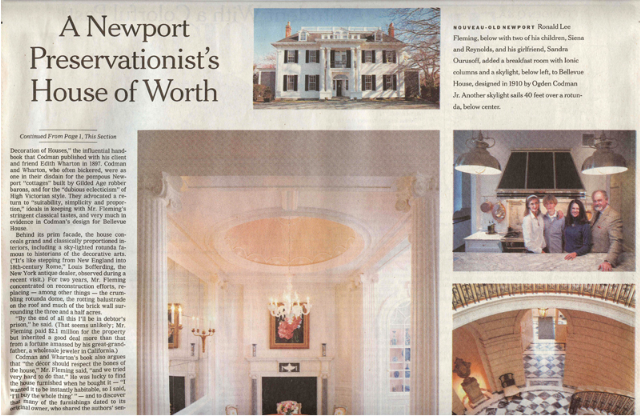 NEWPORT, R.I. - RONALD LEE FLEMING said he felt exultant when he purchased Bellevue House in 1999. The house, a Colonial Revival mansion built in 1910, was the work of the celebrated architect Ogden Codman Jr., and a repository of some particularly colorful social history. Codman had designed it for his cousin Martha Codman, a Boston heiress who scandalized Newport society with her 1928 marriage to a Russian opera singer 30 years her junior; later, the house belonged to a former Ziegfeld Girl who gave singing lessons to the heiress Doris Duke and outlived three wealthy husbands. Bellevue House was in disrepair when Mr. Fleming bought it, having sat empty for seven years. Worse, it was at risk of being sold to a developer who wanted to turn it into a boutique hotel, "which I thought would be tragic," Mr. Fleming said solemnly. Mr. Fleming, an urban planner based in Cambridge, Mass., who has written six books on historic preservation, has a proselytizing zeal on the subject of America's great mansions, and a consuming obsession with the welfare of his own. Hoping to make it a comfortable gathering place for his children in the wake of his recent divorce, he set about restoring it to its one-time glory. The project took seven years, and was finally completed late last month. Luckily, he had a guide in this undertaking: "The Decoration of Houses," the influential handbook that Codman published with his client and friend Edith Wharton in 1897. Codman and Wharton, who often bickered, were as one in their disdain for the pompous Newport "cottages" built by Gilded Age robber barons, and for the "dubious eclecticism" of High Victorian style. They advocated a return to "suitability, simplicity and proportion," ideals in keeping with Mr. Fleming's stringent classical tastes, and very much in evidence in Codman's design for Bellevue House. Behind its prim facade, the house conceals grand and classically proportioned interiors, including a sky-lighted rotunda famous to historians of the decorative arts. ("It's like stepping from New England into 18th-century Rome," Louis Bofferding, the New York antique dealer, observed during a recent visit.) For two years, Mr. Fleming concentrated on reconstruction efforts, replacing -- among other things -- the crumbling rotunda dome, the rotting balustrade on the roof and much of the brick wall surrounding the three and a half acres. Codman and Wharton's book also argues that "the décor should respect the bones of the house," Mr. Fleming said, "and we tried very hard to do that." He was lucky to find the house furnished when he bought it -- "I wanted it to be instantly habitable, so I said, 'I'll buy the whole thing' " -- and to discover that many of the furnishings dated to its original owner, who shared the authors' sensibilities. Martha Codman and her Russian husband, Maxim Karolik, used her family fortune to build a superb collection of 18th-century furniture and paintings and 19th-century art, much of which they donated to create the American Wing at the Museum of Fine Arts in Boston, but some of which remained in the house. 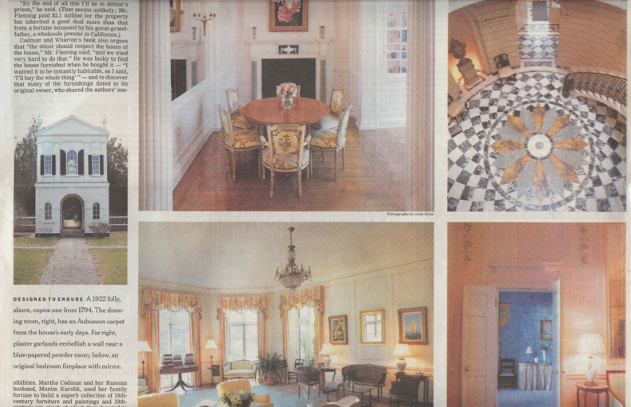 Mr. Fleming found a cache of photographs of interiors from 1922 that helped him determine which carpets and pieces of furniture had been there from the start, including a set of 10 19th-century Chippendale chairs and the dining room's 19th-century table, chairs and buffet. To supplement these pieces, he has slowly been acquiring antiques that he deems suitable to Codman's restrained aesthetic, like a turn-of-the-century version of a Louis XVI settee and matching chairs in the drawing room that he bought last summer at a Connecticut antiques store. "The Decoration of Houses" was not as helpful on every point as Mr. Fleming might have wished, particularly when it came to the house's bleak, utilitarian kitchen, with its broken plywood cabinets, Formica counters and rutted linoleum floor. "In the book they never refer to the K-word," he said. "Our challenge was to step into the mind of Ogden Codman and continue his thinking into the 21st century, where the kitchen is the center of family life." Mr. Fleming hired Jon-Paul Couture, a Providence-based architectural designer experienced in the renovation of historical homes, to remake the kitchen and to design a billiard room for his teenage son, a new wine cellar and a mud room -- all in the spirit of Codman. A wall was torn down between the existing kitchen and an adjacent broom closet, which became a breakfast room with a classical pink-and-white cupola, gilded sconces and a shell-form china cupboard based on a cabinet in the library designed by Codman. A pair of Roman Ionic columns and fluted pilasters now connects the space to the new kitchen, with its Chinese pink-and-green marble counter tops. The dentil molding around the kitchen cornice was painstakingly copied from the one Codman designed for the dining room. Similarly, Mr. Couture borrowed the design of the arched doorway that links the kitchen and dining room to the front hall and repeated it in a series of arches that form a straight line, and a source of light, from the mud room through to the kitchen, pantry, hall, dining room and conservatory beyond. In the interest of adhering to Codman's sense of scale and proportion, Mr. Fleming and Mr. Couture even redesigned an appliance, dispensing with the elaborate hood that came with the kitchen's newly installed La Cornue stove and creating a custom-made version with "scale and details that took their cues from the architecture of the room," Mr. Couture said. For all his concern with living up to the master's vision, though, Mr. Fleming rebelled in at least one area: Codman, he said, "used a green in the dining room that we didn't like." Mr. Fleming chose peach instead. "It's a warm color that's supposed to make ladies more attractive." Outside, inspired by a formal teahouse that was built on the property in 1922 -- a copy of a 1794 architectural folly by the famous woodcarver and self-taught architect Samuel McIntyre -- Mr. Fleming erected a copy of a smaller McIntyre folly from 1799. And he has just received permission from the Newport Historic District Commission to build a third teahouse, based on McIntyre's drawings for the cupola of a church built in Salem, Mass., in 1804 and 1805. Despite his talk of providing a reassuring hearth for his brood, Mr. Fleming seems to have become a little folly-mad of late: He admitted that one of his first priorities had been the copy of the 1799 folly, which was being completed just as work began on the inside of the house. "My kids were really upset that I built a folly before redoing the kitchen," he said. Not all of his construction projects have gone smoothly. He ran into trouble with the commission in 2004 when he erected a pergola on his property without seeking their permission. "I didn't enjoy being reviewed like that," he said archly. "I'm a preservationist and frankly I have more expertise than people on the board." Mr. Fleming and Sandra Ourusoff, his companion of three years and the publisher of Opera News magazine, clearly enjoy their role as hosts at Bellevue House. For a pair of passionate preservationists their first encounter, in 2002, was propitious: "We met in an 18th-century hacienda in Ecuador on New Year's Eve,"Ms. Ourusoff said. The two share a taste for faded grandeur, which Mr. Fleming seems to take to greater extremes. After months of cajoling, he finally capitulated to Ms. Ourusoff's insistence in 2003 that the drawing room's tattered 1960's curtains needed replacing. "They were rags, which Ron was perfectly happy with," said Ms. Ourusoff, who installed swags of pink-and-green fabric from Christopher Norman's New York showroom. "The architecture is really what he's interested in," she added. "The other things he sees as tangential." Mr. Fleming has been under pressure to replace the living room's pink-and-green carpet, which he said he believes is original to the house. "My daughter Siena wants to have it rewoven," he said. Last week he finally got around to taking another distressed carpet to be repaired. A brown-and green-design, it was installed by Jane Pickens, the ex-Ziegfeld Girl, who had it woven in Portugal. Something had to be done: strands of the carpet's fabric were being held together with Scotch tape. As he greeted his dinner guests in a bottle-green velvet smoking jacket the other day, Mr. Fleming seemed oblivious to the sizable rip in the shoulder seam, a future restoration project. After inviting the ladies to retire to the drawing room after supper, he led the gentlemen in a passionate discussion of historic preservation over a glass of port, and basked in his remaining guests' compliments upon his efforts to adapt and restore Bellevue House. "I hope Ogden Codman would have approved," he said, with the air of a man who had no doubt.